A convenient base class for C2 operators with DNNLOWP engine. 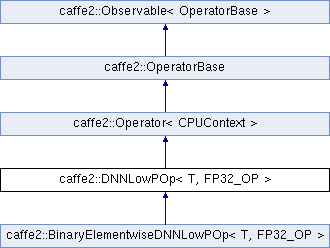 DNNLOWP ops give flexibility on the type of input/output blobs. For example, some inputs can be the usual fp32 tensor and they will be quantized before doing actual computation. Otherwise, the inputs should be pre-quantized Int8TensorCPU. A few constraints: when the weight is pre-quantized if and only if the bias is also pre-quantized. static quantization vs. dynamic quantization When Y_scale and Y_zero_point (optional with default = 0) arg is set, and dequantize_output is false, we do static quantization, meaning we're using the same pre-computed scale and zero_point for the output activation tensor. Otherwise, we do dynamic quantization by looking at the min/max of output activation tensor for each batch. Y_scale and Y_zero_point arguments are used for static quantization. scale and zero_point of Int8TensorCPU is used for carrying quantization information across operators both in static and dynamic quantization. This means scale and zero_point of Int8TensorCPU is valid only for the current batch and will be reset in the next batch when dynamic quantization is used. dequantize_output (default=false): when true, output is dequantized as fp32. Useful when we're only quantizing individual operators rather than doing end-to-end quantization. Conv operators don't support dequantize_output option as an exception because doing so complicate the implementation significantly and having a separate Dequantize operator doesn't add much overhead because Conv ops are usually used in deep networks where regions of quantization are long chains. followed_by (default=null): can be relu, sigmoid, or tanh. When specified, the current operator is only followed by relu, sigmoid, or tanh, and this fact can be used for more accurate output quantization. measure_quantization_error (default=false): when true, L2 error with respect to the baseline C2 operator in fp32 is reported. WARNING: turning this option will make performance very slow and this option is intended for debugging accuracy issues. For the following quantization method related options, please refer to caffe2/quantization/server/dnnlowp.cc for more details. Definition at line 77 of file dnnlowp_op.h.